Graduating students enter the Charles V. Keating Centre for StFX's 2018 Fall Convocation Ceremony on December 1, 2018. Jubilant friends and family filled the Charles V. Keating Centre to watch loved ones cross the stage and receive their hard-earned degrees and diplomas at the StFX’s 2018 Fall Convocation, held December 1. StFX conferred close to 300 degrees and diplomas during the ceremony, including to 41 graduates of the Coady Institute Diploma in Development Leadership program. Coady graduates came from 19 countries worldwide, including the first diploma graduate from Fiji. StFX’s Elizabeth and Thomas Rankin School of Nursing also graduated the first students in its LPN to BScN Accelerated Option (AO) program. In all, 20 students were among the first graduates of the AO program, students who are also Licensed Practical Nurses (LPNs). “Each of you is unique,” said Mr. John Peacock, Chancellor of St. Francis Xavier University during his remarks to students. His comments were echoed by StFX President and Vice-Chancellor, Dr. Kent MacDonald. “We recognize the journey many of you have taken has not been easy. There is no doubt that you have learned much, and that your faculty have prepared you well. But we also recognize that going through this journey means you have persistence, and that you are willing to do the hard work needed to achieve your goals. He also shared a simple but important piece of advice with graduates as they continue their lives and careers following their education at StFX. StFX awarded honorary degrees to Dr. John F. Dewey, an expert in plate tectonics research known as one of the first geologists to apply plate tectonic theory to specific mountain belts, and to Dr. Thomas De Koninck, a scholar, humanist and author widely recognized for his work in human dignity and his writing on the philosophy of education. In his address to students, Dr. Dewey noted that his first visit to Antigonish was 54 years ago when he completed fieldwork on geological formations in Antigonish County. He spoke about his happiness to return to the area, and his pride in receiving an honorary degree from StFX. In his remarks, Dr. De Koninck spoke about the university as “the powerhouse of freedom,” noting the role of universities in helping ensure healthy democratic societies across the world. Dr. De Koninck noted StFX’s reputation as a university that helps students think critically, a skill which he says is vital in helping to create and maintain global freedom. Also honoured during the ceremony were StFX senior human kinetics lab instructor Kelly Thompson, recipient of the 2018 Outstanding Staff Teaching Award, and StFX senior biology lab instructor Randy Lauff, recipient of the 2018 Outreach Award. 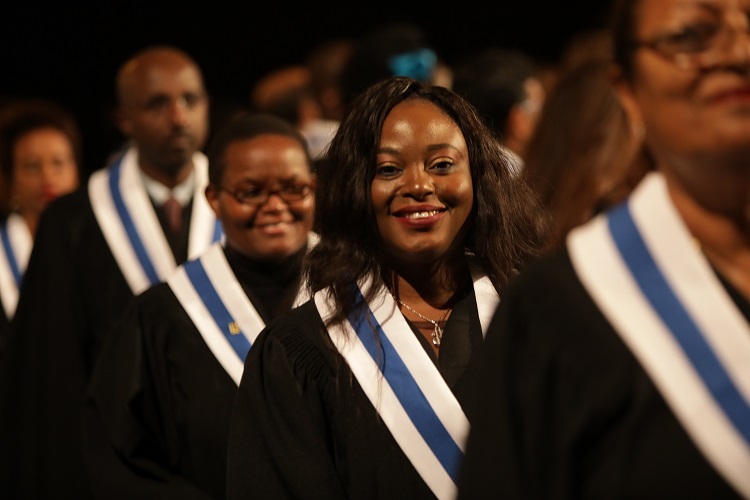 Coady graduate Musola Cathrine Kaseketi of Zambia, delivered the address on behalf of the graduating class. She encouraged all graduates – especially her fellow Coady Institute classmates – to recall everything they’ve already overcome when facing inevitable challenges in their lives and careers. Glenn Horne, president of the StFX Alumni Association, congratulated the new graduates and welcomed them into the Xaverian family of alumni. He also encouraged them to use their experiences at StFX to inspire others and make a difference in the world around them. Dr. John F. Dewey has been described as the leading geoscientist of his generation. He is widely known for being at the forefront of the revolution in the field of plate tectonics, and was one of the first geologists to apply plate tectonic theory to specific mountain belts. For his work, Prof. Dewey has received the most prestigious awards from numerous academic societies, including the Lyell and Wollaston Medals conferred by the Geological Society of London, the Arthur Holmes Medal from the European Union of Geosciences, and the Penrose Medal, the Geological Society of America’s most prestigious medal. He has received several honorary degrees, is a fellow of the Royal Society (FRS), and a member of the Royal Society of London and the US National Academy of Sciences. Prof. Dewey received his first doctorate from Imperial College, London, followed by D.Sc. degrees from Oxon and Canterbury. During his academic career, he held faculty positions at Cambridge, SUNY-Albany, Durham and Oxford universities as well as prestigious visiting fellowships on both sides of the Atlantic. He has authored or co-authored countless influential articles in high profile journals such as Nature and Geology, several with more than 2,000 citations, attesting to his global impact on the science. A proud field geologist, he is very familiar with the Antigonish area. His first academic position in North America took him to Arisaig, NS to instruct geological field methods for M.I.T. He has worked on every continent, and has inspired generations of students all over the world, many of whom have gone on to become academic leaders in their own right. Dr. Thomas De Koninck is an internationally-known philosopher and one of Canada’s leading academics. He has an M.A. Lit. Hum. from Oxford and a PhD from Laval University, and is currently professor emeritus at Laval University in Quebec where, before his 2015 retirement, he taught for decades and served as Dean of the Faculty of Philosophy. A scholar, humanist and author, his work bears significantly on issues essential to the betterment of society. Dr. De Koninck is perhaps best known for his studies on human dignity and for his writings in the philosophy of education. He has authored works that have received international acclaim, including De la dignité humaine, for which he won the Le Prix La Bruyère of the Académie française, the first Canadian to have received this award, and La nouvelle ignorance et le problème de la culture. His reputation as a scholar is equally matched by his reputation as a teacher, and he is known to generations of students as a mentor and guide. He has supervised an extraordinary number of masters and doctoral theses. Over the past 40 years, he has supervised 19 ‘licence’ theses, 158 MA theses and 59 doctoral theses. Dr. De Koninck is a former Rhodes Scholar and a recipient of an Alexander von Humboldt-Stiftung Fellowship. He has received numerous awards, including being elected a Fellow of the Royal Society of Canada. An active member and past president of the Canadian Philosophical Association, he is also a member of the Order of Canada and an Officer of the Ordre des Palmes Académiques de France. Randy Lauff is a senior laboratory instructor in the Biology Department, where he has spent nearly 30 years, making significant contributions and inspiring students. He’s also significantly grown StFX’s zoological collection so that over 60 per cent of Nova Scotia’s mammals and breeding birds are represented; amphibians, reptiles, fish and invertebrates are also included. Specimens, collected by him or by students under his direction, have included North American and Canadian first records, provincial and Maritime firsts, significant range extensions, and documentation of introduced species. Several papers have been written using specimens from this collection. He has supervised both StFX honours students and, as a community resource person, a number of high school students. He is involved with many biological activities outside StFX, including Citizen Science data collection and participation in national and international bird surveys. He is a book reviewer for The Canadian Field-Naturalist and a former editor of Nova Scotia Birds. Active in research, receiving grants of over $50,000 since 1996, he is best known for his owl work. He found the first nests of the Boreal Owl in Nova Scotia, the only ones documented from the Maritimes in about 80 years. He is a frequent invited speaker, author of 19 peer-reviewed publications and a research associate with the Nova Scotia Museum. His favourite student is his four-year-old son Jacob who loves catching bugs and checking owl nests with him. A senior human kinetics lab instructor at StFX since 2001, Kelly Thompson has been a physical educator for 28 years and has provided teaching progressions, technical strategies and general teaching tips for children, kinesiology students and physical education teachers. His passion is to promote physical education and literacy, gymnastics and lifelong fitness. He teaches educational gymnastics skills, principles of fitness skill classes and exercise physiology labs to StFX students. He has created four activity courses and developed one lab at StFX. In 2003, he started the popular HKIN After School Gymnastics Program, which not only provides instruction for local children, but practical teaching experiences for StFX students, who all complete Gymnastics 127. He also created and maintains an educational gymnastics website for StFX students and physical education teachers. Mr. Thompson holds a Master of Education from StFX, is a NCCP Level 4 Coach, NCCP Level 1 and 2 Course Conductor, FIG International Brevet Gymnastics official, and a certified personal trainer. He has presented at local and national conferences and has provided consulting services for the Nova Scotia School Curriculum (gymnastic PE component). He has officiated at the 2004 Olympic Games, as well as numerous world championships, Pan American Games and World University Games. Honours include Life Member Nomination, Gymnastics Canada and the Nova Scotia Official of the Year. Founder and executive director of Vilole Images Productions (VIP), Musola Cathrine Kaseketi is the first Zambian female film director and an international award winner who has contributed tremendously to the film industry in Zambia. She was ushered into human rights advocacy at a very tender age. Through her journey, she has trained many Zambians in film and disability sectors including senior government officials to ensure disability is mainstreamed in all areas of development. VIP is an organization dedicated to using film as a tool for human rights advocacy by creating respect for human dignity and removing bias towards artists, women and girls with disability, and contributing towards changing lives in bringing hope to the helpless. VIP’s passion is about facilitating change to promote an inclusive, friendly society for all.